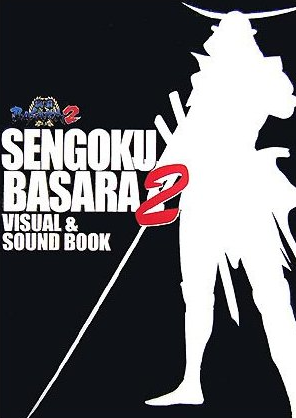 The Sengoku Basara Visual & Sound Book collection is a set of large anthologies which come with audio CDs. Every book in the series contains a jumble of articles in the same vein as a dedicated magazine; the gimmick is that CD contains an audio performance of some of the content. The book I'm reviewing today is the first of three based on the Sengoku Basara 2 game. A third of the book is devoted to 'Gravure of Heroes', a series of character profiles for Date Masamune, Katakura Kojuurou, Takenaka Hanbee, Mouri Motonari and Akechi Mitsuhide. A large number of popular Sengoku Basara artists contribute full-page colour illustrations to accompany the profiles, namely Haibara Yak, Fujisaka Kimihiko, Shishizaru, Kugawara Kadzuki, Shimotsuki Kairi, Sugiura Yoshio, Enomoto, Yamamoto Kana, Kazama Raita, Rei, Hitaki, Nanase Aya, Sasakura Kou, Tobashi Kotomi, Yumeji Kiriko and Hirooka Masaki. The paintings of Kojuurou vary wildly in theme (he wasn't yet playable at the time or in possession of his own story mode to expand on his character) but there's a good mixture of styles. I like that the profiles also include nice big pictures of the characters' alternate costumes. The next part of the book is devoted to seiyuu interviews. The actors featured are Hoshi Souichirou (Sanada Yukimura), Koyasu Takehito (Sarutobi Sasuke), Paku Romi (Uesugi Kenshin), Genda Tesshou (Takeda Shingen) and Kuwatani Natsuko (Kasuga). There's even half a page for often-overlooked Sengoku Basara narrator Watanabe Hideo! Not coincidentally, these particular seiyuu also provide the voice work for the special CD inside the book. The manga is fully voiced on the CD. Weirdly, the order of the final two scenes is reversed for the audio performance, making it confusing when you're following along with the story in real time. Presumably it was done to heighten the suspense. To help the drama on the CD stand alone, appropriate narration and reaction sounds are added to the script at moments where the manga had no dialogue. After the manga several pages are dedicated to the new game that was in development at the time, Sengoku Basara 2 Eiyuu Gaiden (Heroes). As part of this there is a two-page spread about the Basara Matsuri 2007 ~Haru No Jin~ event with a few tiny photographs. Fan contributions including artwork, letters and gags complete the book. Regular artist Nishizawa Sabroh provides two yonkoma comic strips along with the usual fan page title illustration this time around. Sengoku Basara 2 Visual & Sound Book Vol. 1 was published on 15th May 2007 by Media Works and it's still available for purchase from all good Japanese bookstores such as Yesasia and Amazon at the original price of ¥1,800.